If you follow developments in the Digital Finance and Commerce (DFC) space, you get no prize for knowing who Travis Kalanick, Jack Ma or Narendra Modi are. But if you are outside India, it is likely that you aren’t familiar with the name Vijay Shekha Sharma. That seems likely to change, however. As the founder of Paytm, India’s biggest mobile wallet operator, Vijay Sharma seems set to join the rostrum of digital payment champions who are actively changing how the world transacts in the mobile age. Somewhat ironically, if any three individuals outside of Paytm (and its parent company One97 Ltd.) deserve a share of the credit for the explosive growth in Paytm’s mobile wallet in India, one wouldn’t need to look much further than the triumvirate of Kalanick-Ma-Modi. Between them they represent the three prongs that have so successfully catapulted Paytm from relative obscurity into the DFC stratosphere: embedded payments; offline m-payments; and proactive government policy. The Paytm story can, perhaps, be best understood if examined through the roles of Vijay Sharma, and the three digital deities (of both good and ill) mentioned above. Sharma, the company’s [gregarious](http://economictimes.indiatimes.com/topic/Vijay-Shekhar-Sharma) CEO, is well on his way to becoming a household name in India, such is the growing popularity of Paytm and his propensity to putting his name and face in front of a camera. Paytm’s parent company, One97, was founded by Sharma in 2000, initially providing horoscopes by SMS. In 2010, One97 launch Paytm (standing for ‘Pay through mobile’) after Sharma observed the success of mobile wallets being used for mobile top-ups. It was only three years ago, in 2014, that Paytm’s exponential growth into the big time began, with a move that revealed the scale of the company’s ambitions. Paytm’s first CEO, Harinder Takhar, moved to Toronto to found the company’s R&D off-shoot, Paytm Labs. The timing was fortunate, for the behemoth of embedded payments, Uber, was fighting to get a toehold in India, and was struggling with the lack of digital payment options (to the point where it had, revolutionarily, started accepting cash). Takhar successfully brokered a partnership between Paytm and Uber that set up the Indian mobile wallet as Uber’s exclusive digital wallet partner in India until this year. For the next three years, Uber’s growth in its largest operating market, and Kalanick’s ambitions to conquer the taxi world, would be inextricably tied to the Paytm brand. Uber's relationship with Paytm is ongoing. Having spun Alipay off from Alibaba and into Ant Financial (but still under the Alibaba Group umbrella), Alibaba Group’s founder Jack Ma saw in Paytm a kindred spirit, two synergistic companies whose two home markets between them contained half the consumers in the entire world. Consequently, early 2015 saw a strategic alliance between One97 and Alibaba Group, in which the Chinese DFC behemoth took a stake in One97 for US$575 million. Around the same time, Indian industrialist billionaire Ratan Tata, of Tata Group fame, also took a rare personal stake in One97, flagging to the Who’s Who of India (if they weren’t already aware) that Paytm was now a big-league player. All the while, Paytm was expanding the suite of services that it offered within its wallet, careful from the start to avoid being identified as simply a P2P service. In addition to mobile top-ups, bill pay and the ability to buy movie and travel tickets proved to be hits with consumers (booking over one million train tickets per month! ), with the result that by the end of 2016, Paytm had 177 million users, 45% of whom had been active in the month of December. With seven million transactions per day, the company claimed to be processing more daily transactions than India's credit and debit cards combined. Crucially, however, 2016 saw Paytm take a leaf from the Alipay playbook and strengthen its offline presence, so that by the end of the third quarter it had one million merchants signed up and ready to accept Paytm as a means of payment. But it was the intervention of India's Prime Minister, Narendra Modi, and his ["demonetization" policy](http://www.economist.com/blogs/economist-explains/2016/11/economist-explains-6) that really set a fire under Paytm's offline demand. Struggling to accept non-cash payments, merchants flocked to the mobile platform. Within days of the early November demonetization announcement, Paytm announced it was hiring 10,000 agents to do merchant onboarding, in an attempt to double its merchant numbers to two million by year's end. According to the company's narrative, they were successful in this remarkable feat. All of the above would be enough to make Paytm a global DFC phenomenon. But thanks to another plank of the Modi government's banking and economic policy platform, Paytm stands on the verge of making a transformation that no other player in the world has been able to achieve: become a bank. Payments Banks cannot issue credit or credit cards, or permit customers to hold balances of more than 100,000 rupees (approximately US$1,500), but they can issue debit cards and check books, and, of course, be used to fund Paytm wallets. The transition to Payments Bank, therefore, was obvious, given that Paytm was already offering bill payments and P2P remittances. While Paytm Payments Bank (51% owned by Sharma personally) launched a few weeks ago, it remains to be seen whether the company can live up to its promise and achieve the holy grail of recycling funds within the digital payments ecosystem, and avoiding the dreaded cash-out. The new bank promises to keep savers' money "absolutely safe" by investing it only in Indian government bonds, and paying 4% interest (RBI's benchmark rate is currently 6.25%). And while Paytm didn't need another vote of confidence from a major player, if it is going to make good on its plans to boost its user numbers to half a billion, it is certainly going to need plenty of cash -- some US$1.4 billion of which was provided by Japan's SoftBank just a few weeks before Paytm Payments Bank went live. Significantly, not only is SoftBank one of the few DFC players with the resources to be able to make that sort of investment, the Japanese cash injection ties Paytm even more closely into the Alibaba orbit. SoftBank was an early investor, and largest shareholder, in Alibaba. SoftBank Chairman Masayoshi Son and Alibaba founder Jack Ma sit on each other's boards. 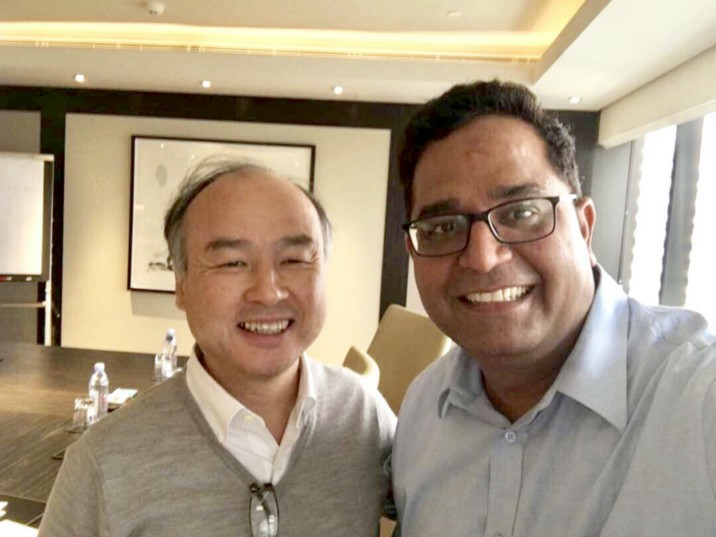 Masayoshi Son and Vijay Sharma, from Paytm's blog. It is hard, therefore, to imagine a DFC platform, headed by the tenacious Sharma and with a sprinkling of Uber, Alibaba and Modi magic, that is better placed than Paytm to bolster an ecosystem in which funds remain digital. The regulatory environment is pretty much as enabling as they come, and the company has cash and significant strategic investors and an enormous market to which to cater. Close attention, therefore, should be paid to Paytm's next evolution, because if they can't bring customers with them to the sunny uplands of digital payments, then perhaps no-one can, and it is time for everyone in the DFC space to re-examine the fundamentals of what they are offering the consumer, and how they are going about it. Until then, expect to hear a lot more about Vijay Sharma and Paytm in the years ahead.